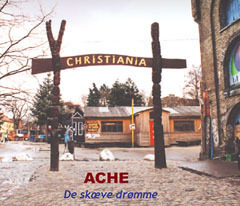 The Ache Rock Band Official Website, Denmark: Ache history. 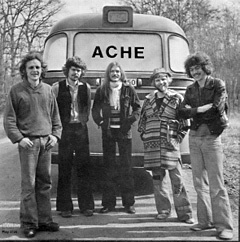 ACHE's hit ballad "Shadow of a Gipsy"
"For every band that became big in the early 70s, there were at least 20 bands that were as good, but they never got the necessary breaks. Denmark's Ache is an absolutely excellent rock band. This band is driven by the combination of Hammond organ and guitar. 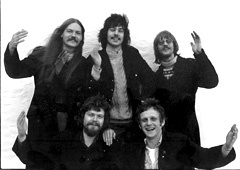 A sound made popular by Vanilla Fudge, and later explored by the likes of Deep Purple and others. "De Homine Urbano" was originally released back in 1970, and it's perhaps the first rock ballet. The music on this album was written to accompany a ballet. It's quite interesting what Ache did here. They adapted the current sounds of the 1970 to a delicate art form such as ballet. The result is overwhelmingly impressive. The album can be enjoyed by variety of listeners, and neither style and sound is compromised in any way. An achievement not copied to this day, although few came close. "Green Man" was released a year later, in 1971. This time Ache went for a straight forward progressive rock direction, with no ballet or other artistic forms involved. "Green Man" is a superb album. It really reflects the times it was made in, and it has that explosive feel. This record needs to be listen to loud in a very dark room. The band turns on elements of progressive and psychedelia, and just rocks all the way through. Ache is certainly a band worth investigating! Even after 40+ years since these two album were released, they still pack a solid punch. Why this band never made it any bigger is beyond this writer's understanding. All of the ingredients are here. 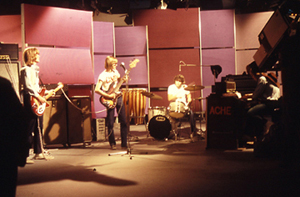 If 70s rock is your cup of tea, Ache will make you an instant fan!" ACHE's first album "De Homine Urbano", released internationally by Philips in early February, 1970, consists of two long music suites, one on each side of the LP record. Side A is the title track: the ballet music composition "De Homine Urbano" which was recorded in a single day in early June, 1969, in the Metronome Studio A in Copenhagen. "De Homine Urbano" is a purely instrumental piece, recorded with hammond organ, electric and acoustic guitars, grand piano, electric bass and drums. Side B, "Little Things", was also recorded in a single day, in the same studio, in October, 1969. "Little Things" is predominantly instrumental, but here and there through the piece appear short vocal passages, sung in English. When, in 2000, Universal Music Denmark reissued the LP "De Homine Urbano" on CD (UMD 159 632-2), by mistake, the music on the two record sides respectively was interchanged. Even though the track list has "De Homine Urbano" as number 1 on the CD, what you hear is in fact "Little Things" - then follows the music of "De Homine Urbano" as number 2, but listed as "Little Things". This state of affairs repeats itself on many internet websites, where the two music suites can be downloaded (or streamed), and the same applies for the "De Homine Urbano" CD in the Universal Music Denmark triple CD box set "Dansk Rock Historie", released in 2010. With the new CD reissue of the album "De Homine Urbano", however, released internationally by Esoteric Recordings, UK, in September, 2012 (ECLEC2344), the mistake was properly corrected, the "De Homine Urbano" suite opening the CD as track 1, followed by "Little Things" as track 2, in full accordance with the original 1970 LP record. DANISH ROCK BALLET "DE HOMINE URBANO"
With the introduction of beat music into those areas traditionally reserved for classical music i.e. the theatre and ballet, the door has been opened to a larger audience. The largest audience, the beat generation. 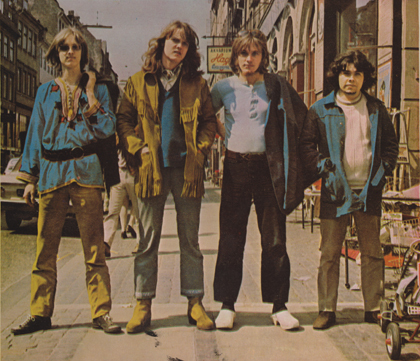 This has been shown by the Who's contribution to opera music with their version of "Tommy", and now ACHE, the Danish beat scene's most interesting and forthcoming group. Standing ovations and gushing reviews saluted the rockballet "De Homine Urbano", and the enthusiasm was referring to the electric made music - the first of its kind to be heard in the famous Royal Theatre in Copenhagen. 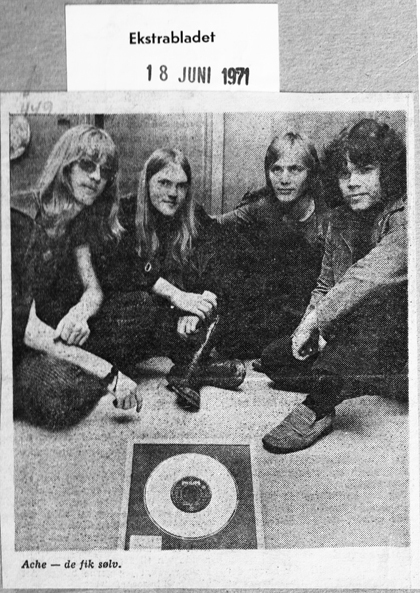 The music constitutes half of the LP and the originators of the new art-form, ACHE, who for more than a year has been considered as one of the most original and productive rockgroups in Scandinavia, hereby got a decisive breakthrough and also had a tempest certification on the carrying capacity of their talent. The music was created in an intimate cooperation with the dancer Peter Schaufuss from The Royal Danish Ballet Company. In a remote house in the country they established a hardworking collective unity in the winter of 1969 and succeeded in getting the music and choreographical tradition together. Just before that happened, ACHE set the Danish rock-scene on fire by doing a lot of solid gigs all over the country. They also appeared on TV with their fantastic act. The organist PETER MELLIN - one of the most talented in Europe to-day - has been educated in classical music at the Danish Academy of Music but his playing sticks more to modern inspiration than to dusty tradition. 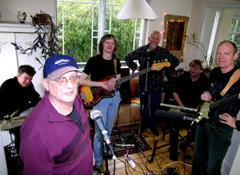 The brothers FINN and TORSTEN OLAFSSON on respectively leadguitar and electric bass often sit by the piano in the enormous house of their parents. Some of the best tunes result from the free sessions in this place and the unconscious power takes the lead in the compositions of the group. GLENN FISCHER, a former collaborator at a record company and the drummer in ACHE, won unfading honour when he stripped to the waist during a concert in open air last summer. "In the past few years, there has been a cultural explosion of the popular arts. Young artists, and aged ones for that matter, have found the traditional forms arbitrary, and experimentation even at the risk of artistic anarchy, have revolutionized i.e. : Pop music (as it was then called) art and to a lesser extent the theatre. This in turn has found its life form in our society. But mainly through beat music are we able to feel the extent of its impact. That beat music seems to have synthesized most of the intellectual and artistic movements of our time, cross fertilizing them rapidly toward fruition, is well known, but this doesn't account for its truly fantastic popularity with the public. The reason, we feel, is largely due to its attitude towards the audience-artist relationship and the ways and means employed in breaking down the stereotyped idea of what constitutes the "proper" artistic stance and audience response. Wishing to introduce the art of ballet to a wider audience we knew, that to capture this audience, we had to incorporate their language, their medium into the art form. Only with these goals in sight would it be possible for us and audience to find a rapport, fusing in a continuum of light, sound and movement we started this project: A beat ballet. It has been a great challenge, to put ballet and beat music together, and we can only hope we have achieved our aims. The four musicians, who together make up the group ACHE, wrote and performed a beautiful piece of music, and we feel that ballet will not only be grateful for having its doors opened to a wider audience, but also for its having had a serious contribution to its art form." In the summer of '69 Annemarie Dybdal and Peter Schaufuss, both from The Royal Theatre in Copenhagen, performed part of the ballet "De Homine Urbano" at the famous Bolshoi Theatre in Moscow, Russia. is the title of the B-side of the LP. This piece of music deals with the little things around us. It all started in January '68, but much has been changed since then. Many times new ideas were added. Many times some old tunes were left out. In this way - little by little - the idea has grown and grown. One of the last ideas before the actual recording of this album literally sprang out from a mood of pure tranquillity. Musically it is contained in the very last quiet minutes of the whole thing, i.e. the coda. Imagine harvesters in a wide waving field, doing their daily task. Tired but happy. Contended in being in any part of the world, whether it be in South Africa, the U.S., Russia. No matter where your imagination may take you it will still be the same. An old Chinese poem said that "music is an expression of the harmony in the heart of Man". This music expresses the sentiments of ACHE. They made it the way they really feel things. And in case you're looking for a political meaning in the music, be assured that you'll be wasting your time. 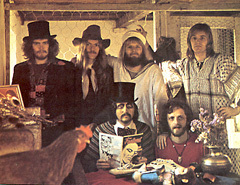 Released on the Philips label on August 12, 1970, the symphonic rock ballad "Shadow of a Gipsy" soon made it to the charts in several European countries. 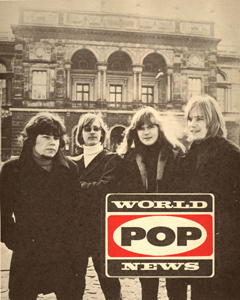 In June 1971 ACHE received a silver record for the sales of more than 50.000 copies, especially sold in France. 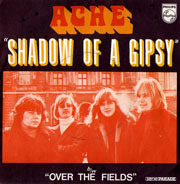 In June 1971 ACHE received a silver record for the sales of more than 50.000 copies of their hit-single "Shadow of a Gipsy"
- especially sold in France. "Progressive rock band ACHE appears to have had a musical influence on Nintendo composer Kōji Kondō." Copyright © 2003-2012 by Ache c/o Olafssongs, Denmark.